For the past decade, legendary developer Peter Molyneux has tried to create revolutionary games all on his own. Here’s why he has to stop. Molyneux, the creator of cult classics like Dungeon Keeper, Populous, and Fable, has been struggling for years to be successful in the indie scene. His struggles have earned him both the sympathy of game developers and 80’s kids who played his classics, and the resentment of 90’s kids who hate him for over-promising. 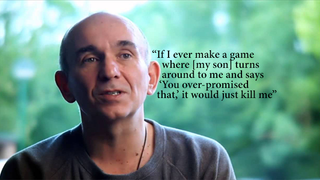 Peter Molyneux is one of the most passionate developers to ever live, but also one of the most dysfunctional ones. He is a self-proclaimed bad PR person, and is terrified of his own failure, because he lived for many years as the ultimate game developer. Because Molyneux has a permanent desire to maintain that status, he continues to be too ambitious. At this age in gaming, creating a revolutionary game with the scope of hundreds of hours of gameplay requires more than a small indie developer and a half million dollars. The game Molyneux wanted to make would require millions of dollars and hundreds of developers. As of now, 22cans is out of money, only has 26 people working on the game (6 of which dont actually work on the game itself) and even then the team is losing members. Either Molyneux needs to find a publisher willing to fund the escapade that is Godus, or quit while they’re far behind and start a much smaller game. Molyneux expected the game to sell as much eight million copies, a ludicrous amount considering most triple A games dont sell more than 4 million copies in their first year. The Godus’ multiplayer servers (which dont exist even a year after Molyneux made the claim) were supposed to accommodate up to eight million people at a time, suggesting Molyneux expected millions of sales. Not only is this unrealistic, it is unhealthy for a game developer to expect millions of sales from an extremely incomplete game. Bioshock Infinite did not surpass 10 million sales until a full two years after its release. Molyneux’s expecations for Godus are near impossible. None of the people that Molyneux has worked with in the past have thought this was possible of themselves. Sean Cooper, a member of Bullfrog, the team Molyneux used to create his legend, has gone on to make browser based games which significantly smaller scope and became much more successful. Cooper went on to create the Boxhead series, a series of isometric zombie shooters. They were very simple, but well polished. This boosted Coopers career, and he lives a modest life making web browser and mobile games. Molyneux is in every way a more creative developer than Cooper. That is why Molyneux needs to follow in Cooper’s footsteps. Cooper may have created his own company in the end similar to Molyneux, but at this point Cooper is much more successful because he focuses on what he can handle rather than projects that are unrealistic. The man who won Molyneux’s Curiosity contest, Bryan Henderson, has gotten nothing because, surprise surprise, Molyneux promised something he couldn’t deliver. Rather than giving Henderson a prize that had not existed yet, Molyneux could have easily been given a multitude of other prizes that could be delivered immediately. Henderson could have been given a job related to community management, or worked as a creative lead/contributor to the direction of the game. Instead, they offered him control of multiplayer, something that would not become reality for years, and a cut of the games profits. The only problem is, neither existed. The game still isn’t profiting, and there is no multiplayer. Molyneux needs to lower his expectations of his team, and more importantly himself. He wants to be a god of gaming, but the only ones that really exist don’t even make video games any more (Markus Persson and Gabe Newell). I have the utmost respect for Peter Molyneux as he does care about what he is doing, regrets failing, and truly does want to create great games. He has the potential to do great things, but unless they lower the bar a few miles, 22cans will fail. Molyneux’s successful titles were never huge, complicated titles. They were just interesting ideas that we had never seen before. They were so simple, and had such great aesthetics. Populous was an incredibly simple game with addicting gameplay, Dungeon Keeper had ideas never seen before, and Fable was just a beautiful RPG with a modest story. He needs to understand he doesn’t need to be rich to be good at what he does, he only needs to inspire people to create games the way he did more than a decade ago.